Value priced! It's another energy-packed musical party--this time with all-newlt;I>Kidz Tunz Bible Songs 5" andlt;I>6." The stories of the Bible are timeless, but this generation of kids needs a fresh sound of its own.lt;p>"Bible Songs 5" blends fifteen brand-new songs that put a fresh spin on more favorite Old Testament stories.lt;I>Bible Songs 6" celebrates more New Testament stories with contemporary music and lyrics in another fifteen brand-new tunes of pure delight!lt;p>Lyrics included in both cassettes and CDs; CDs also include a 32-page devotional book. - Publisher $lt;B>Value priced $lt;/B> $lt;P>It's another energy-packed musical party--this time with all-new $lt;I>Kidz Tunz Bible Songs 5$lt;/I> and $lt;I>6.$lt;/I> The stories of the Bible are timeless, but this generation of kids needs a fresh sound of its own. $lt;p>$lt;I>Bible Songs 5$lt;/I> blends fifteen brand-new songs that put a fresh spin on more favorite Old Testament stories. $lt;I>Bible Songs 6$lt;/I> celebrates more New Testament stories with contemporary music and lyrics in another fifteen brand-new tunes of pure delight $lt;p>Lyrics included in both cassettes and CDs; CDs also include a 32-page devotional book. 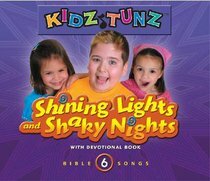 About "Shining Lights and Shaky Nights (#06 in Kidz Tunz Bible Songs Series)"
$lt;B>Value priced $lt;/B> $lt;P>It's another energy-packed musical party--this time with all-new $lt;I>Kidz Tunz Bible Songs 5$lt;/I> and $lt;I>6.$lt;/I> The stories of the Bible are timeless, but this generation of kids needs a fresh sound of its own. $lt;p>$lt;I>Bible Songs 5$lt;/I> blends fifteen brand-new songs that put a fresh spin on more favorite Old Testament stories. $lt;I>Bible Songs 6$lt;/I> celebrates more New Testament stories with contemporary music and lyrics in another fifteen brand-new tunes of pure delight $lt;p>Lyrics included in both cassettes and CDs; CDs also include a 32-page devotional book.